Breitner now searched abroad for new challenges. Real Madrid was next destination and he continued to win more trophies in the Spanish capital. When he came back to Bayern after three years in 1977, he had won two league championships with Real and a Spanish Cup title. Paul’s international career was in the meantime temporarily over. 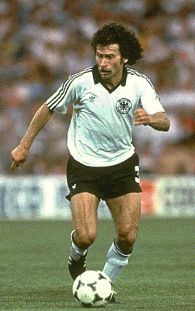 Disagreements with the coaching staff and certain players made him stay away from the West German national team for several years, but he changed his mind on the eve of the 1982 World Cup in Spain. Rummenigge was one of several players who said the team needed him after a run of poor results in the build-up to the finals. In his midfield role, Breitner guided West Germany to the final where Italy beat them 3-1. Breitner scored the West German goal making him only the third man, after Pelé and Vava, to score in two World Cup finals. He retired in 1983 having won many trophies including seven league championships in Spain and West Germany. Breitner was also named German Player of the Year once.